Andy Moore has set off on a rather large undertaking - The large, cold war era US M1911 C-HET Tractor and its accompanying Trailer the M747 Heavy Equipment Semi-Trailer in 35th scale from Meng Models. He has paused to give us a look at what is inside the kit box before he starts the build in two - that's right, TWO in-box reviews because it is so darn large. We will look at the trailer next, but today we look at the Tractor - truck unit. Honk Hoooooonk! In the words of Professor Peach, 'I like 'em big... BIG! ', so I was looking forward to getting my dirty little hands on this huge pair from Meng; truck and trailer pair that is. 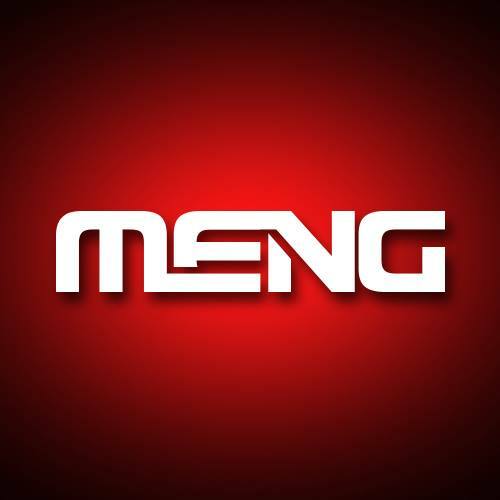 This is certainly one of the largest kits that Meng have released to date, with the finished build coming in at around 57cm (22 ½ inches) in length, and using almost 850 parts in the process. We'll look through those parts in detail in a moment, but first a little background on the M911. 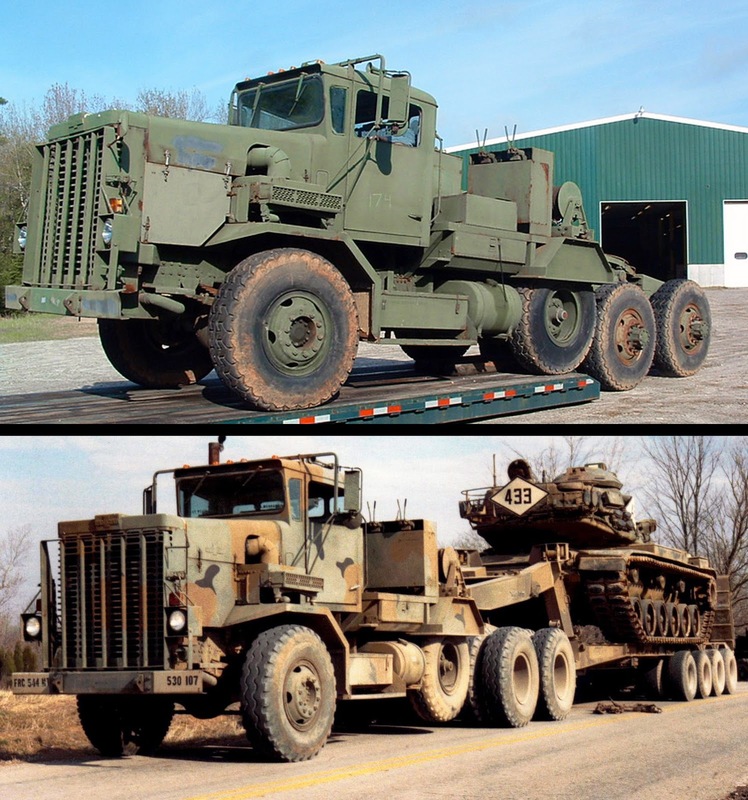 The M911 C-HET (Commercial Heavy Equipment Transporter) came about as a result of a US Army requirement for a tank transporter to replace the existing M746 tractor unit which had been expensive to maintain and operate. 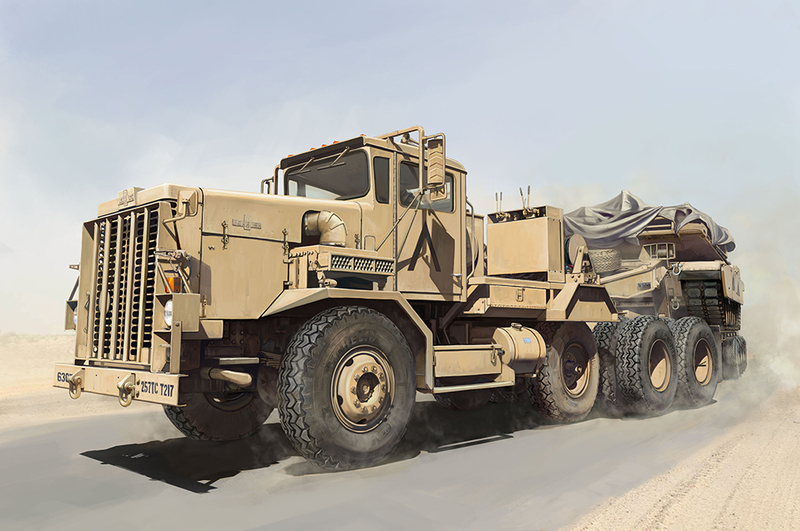 The Army wanted a vehicle with a proven commercial background that would be more reliable and cheaper to maintain. 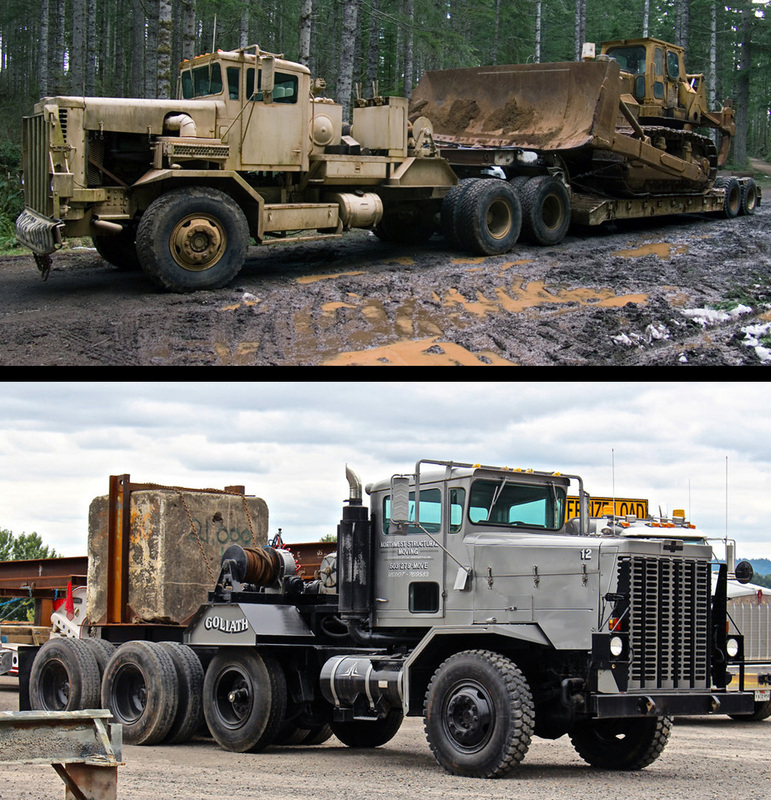 The contract ultimately went to the Oshkosh Corporation who based the M911 on their F2365 truck. Production began in 1977 with over 700 units built. 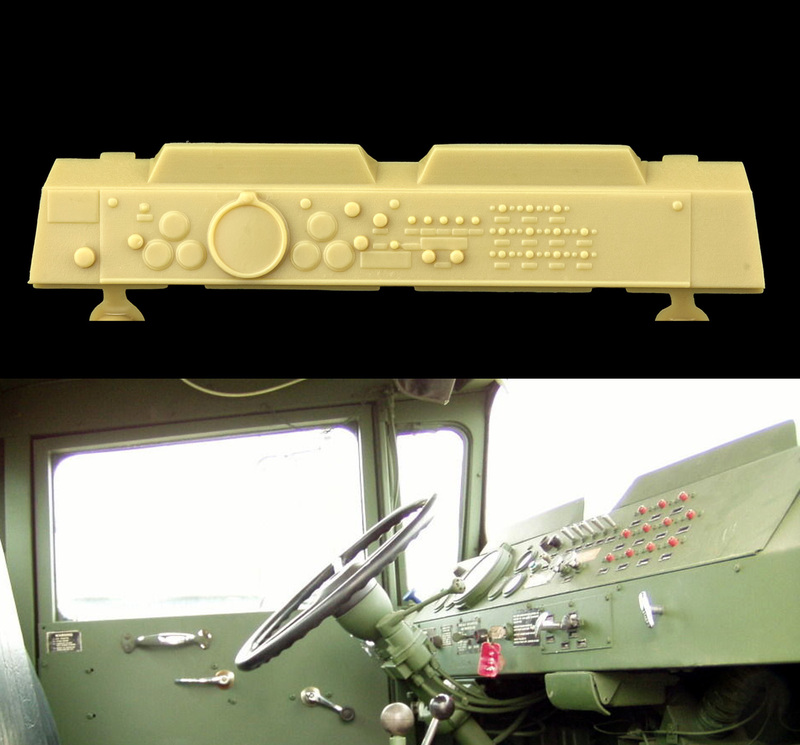 The M911 was used in conjunction with the M747 Heavy Equipment Semi-Trailer for road transportation of main battle tanks, self-propelled artillery and other heavy loads. A 450 hp turbo diesel engine provided power to six of the eight wheels, with the first of the three rear axles being unpowered and acting as a pusher axle to take some of the load from the fifth wheel coupler, and could be raised when not required. 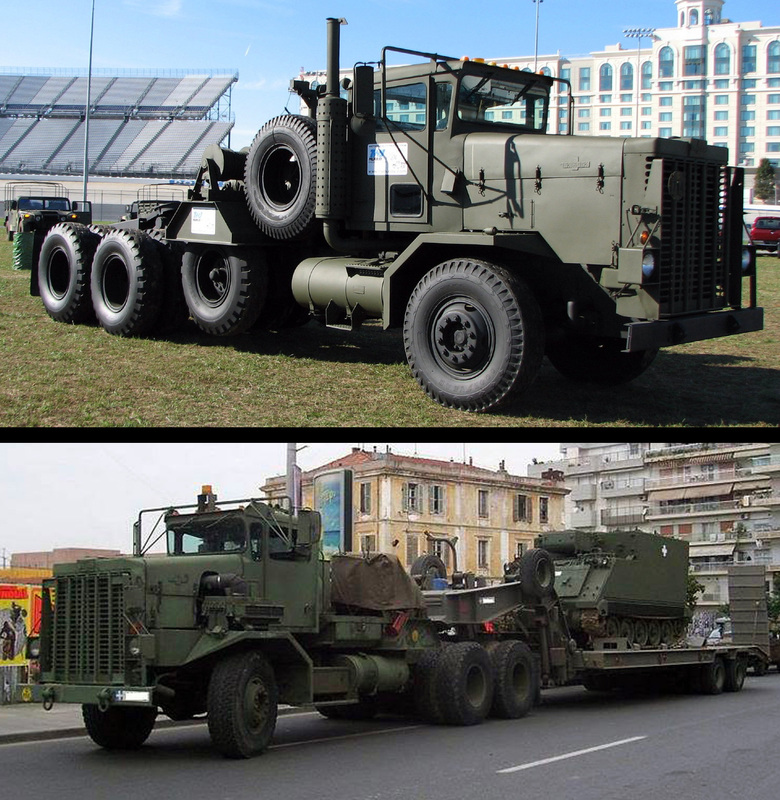 Although the truck/trailer combination had a nominal load capacity of nearly 70 tons, in practice it struggled with loads in excess of 60 tons. This proved to be an issue when the M1 Abrams entered service with the US Army, as the new MBT was close to the M911's weight limit. By the time of Desert Storm, the weight of the Abrams had increased to a point where the M911 really struggled to transport it, and ultimately lead to the M911's replacement with the more powerful Oshkosh M1070. Although most have now been retired from US Army service, the M911 is still in use by Thailand, Greece, Saudi Arabia, Morocco and Oman, as also with private commercial operators. Unsurprisingly, the kit comes in a fairly sizeable box, and you'll find plenty packed inside when you lift the lid. In total there are 15 sand coloured sprues plus an additional sprue for the clear parts. All these come individually bagged for protection. There are two bags of rubber tyres, 13 for the tractor unit and 17 for the trailer including the spares that are carried on the vehicle. Also supplied in the same synthetic rubber as the tyres are 6 shock absorber sleeves for the tractor and trailer suspension. You'll also find two sheets of photo-etch parts, six steel axle rods, two sets of poly-caps, two lengths of braided cable for the winches, two lengths of plastic-coated wire, one in blue and one in red, for the electrical connections between the tractor and trailer, a set of foil stickers for the cab mirrors and a full set of masks for the glazing. Rounding out the package are the instruction manual and decal sheet. 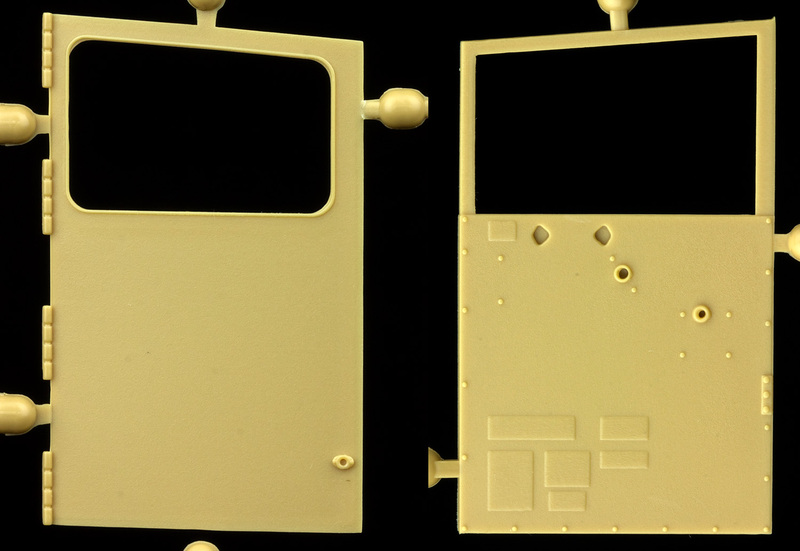 First off we'll look at the tractor unit sprues (A-E). This is a fairly complex build, and a lot of the parts here are small and go to make up sub-assemblies that form the bulk of the build. There are a few options as you go along, such as raised or lowered positioning for the pusher axle, so you'll need to study the instructions carefully as you progress through the build. First up we've got a couple of sprues holding the wheels, together with some of the small detail parts for the suspension and transmission. Like many of the other sprues, this one has a lot of tiny and delicate parts, and you'll need to take care when removing them. The wheel hubs are well detailed, and should look good with some oily weathering. This one holds the main components of the cab and bonnet, and also holds the two main chassis rails. Those chassis rails alone are 26cm (10 ¼ inches) long which should give you some idea as to the size of the finished truck. By comparison, a King Tiger is about 8 inches long on the hull. The two cylinder pieces you see on the left side of the sprue are used as a bending former to shape the photo-etched screens that cover the exhaust stacks. You won't see all that much of the chassis on the finished build, but Meng has fully detailed the rails all the same. Meng has made great use of slide moulding techniques across the kit, such as here with the front of the cab. That should ensure the main assemblies build up without any alignment issues. The bonnet (hood) is also slide moulded and has some nice fastener detail on the sides. Unfortunately, the prominent OSHKOSH nameplates are missing from the front and sides of the bonnet. Licensing issues I suppose, but it would have been nice if they'd moulded the shape of the plate on, even if the text was missing. Perhaps an after-market company will make these available in the future. 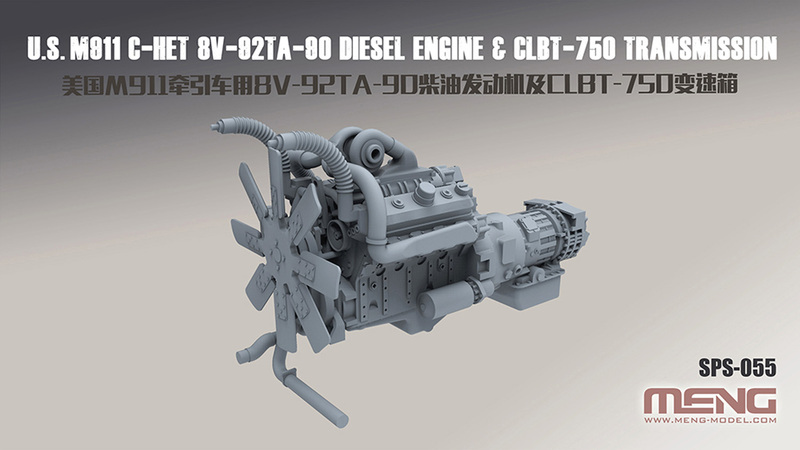 While we're dealing with the bonnet, Meng has also released a separate engine set for this kit as part of their Supplier range of accessories. The only trouble is I don't see any easy way of displaying it, as the bonnet is moulded as a single piece without any removable panels. I guess you'd just have to leave the entire bonnet off if you intend to use the engine set. The bullbar is another slide moulded part, although in this case, it'll need a little more clean-up as there are quite a few mould lines and some flash on here. It shouldn't be too much of a problem though, and it'll save you having to build the bars up from separate parts. More cab components here, including the doors and some of the interior parts. There's also an additional use for the sprue itself which I'll cover in a moment. The cab floor and back wall are slide-moulded as a single part and there's some nice texturing on the floor to replicate the non-slip matting. The cab doors can be posed open to show off the interior, and they feature separate liner panels so both sides are fully detailed. One nice touch that should make assembly a little easier is the single piece frame for the rear view mirrors. This can be painted separately then dropped into place on the completed cab at the end. The instrument panel is well detailed, and you get a full set of dials and placards for it on the decal sheet. It looks to be a pretty good match to the real thing. As mentioned above, there's an additional feature built into the sprue itself. These four raised sections act as a support jig to hold the chassis during assembly. The sprue is rather flexible though, so to make use of it, you'll need to remove the whole section from the rest of the sprue (and remove all the parts as well), then tape the jig to a flat surface to ensure it's square. If that's done though, it should work very well. This holds many of the parts for the rear winch assembly together with other detail parts for the back of the truck. There are also parts for the radiator on here. The main base for the twin winches is a one-piece moulding and has some nice tread plate textures moulded on. 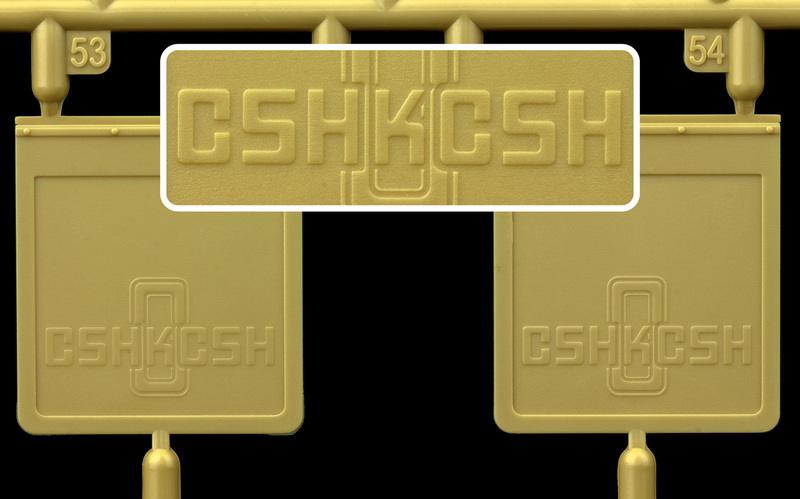 The mud flaps for the rear wheels are on here too, and Meng has circumvented any potential trademark issues by carefully misspelling the OSHKOSH name by representing the two O's as C's. In practice, I don't think it will be too noticeable, but you can always fill in the missing areas of text with some filler if it bothers you. 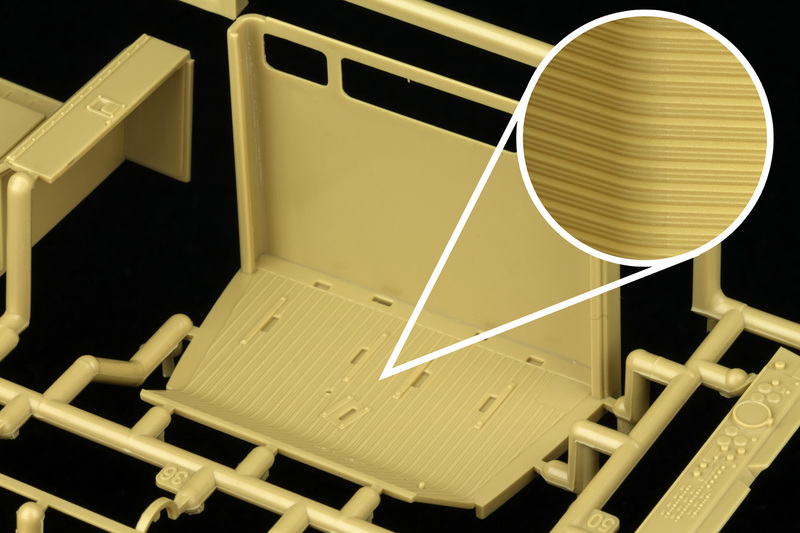 The final sand-coloured sprue for the tractor unit holds the bulk of the transmission and suspension parts, and there's a lot of very intricate detail on display here. Although there's no engine provided in the box, you do get a very complete transmission assembly. The prop shaft sections feature some neatly moulded joints, and the axles and diffs also have a lot of well-rendered detail. The bulk of the clear sprue is for the tractor unit, apart from a couple of small tail lights for the trailer. The clarity of the glazing is excellent with virtually no rippling or distortion. A good thing, as you don't want the view into the cab to be compromised by poor clear parts. That wraps things up for the first part of the in-box review. In part 2 we'll look a the trailer sprues and all the extra bits and pieces that come with the kit. 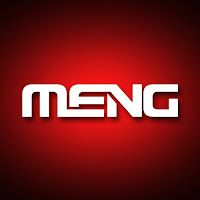 That will be coming soon on TMN. Many thanks to Meng Models for sending this kit to Andy to review and later to build.